Tackle Box Restaurant Coming To PQ Soon? 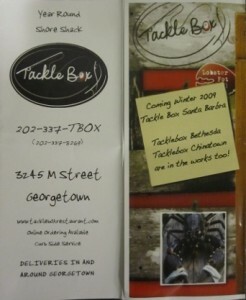 Thanks to loyal PQL reader, Cheryl, for sending in the tip that Tackle Box Restuarant is looking to expand into the PQ! Currently located on M Street in Georgetown, this restaurant felt comfortable enough to announce its planned expansion into the Penn Quarter by printing it on the backside of its menu! ugh. no thanks. this place is not that good. made for the college student that can’t afford subway. The food is great; healty and taste’s great. Wood smoked fresh fish & veggies the highlights, not sure what place Anon 10:37 actually dined in, this is not a bread and deli place. The Lobster Bake on Suday night for $40 is amazing. I think Anon 10:37 is a Subway owner…Tackle Box is awesome! Just looked at their menu. Looks good to me. The prices aren’t bad, but unfortunately for the college students that can’t afford Subway, the appetizers cost more than a Subway sub. Considering there are no 4 year public universities in DC, I would not be surprised if Tackle Box were full of these poor college kids from G’town, GW and AU. Tackle Box is terrific! We need more restaurants like it in PQ: casual, reasonably priced, fresh, healthy food. I’ll be there often if they come our way. We LOVE Tackle Box…perfect for a pre-movie evening at G’town theater. I think it will be a great addition to PQ…..they serve Breakfast, lunch and dinner too!! Much needed! Now if we could just get a really good Pho place and a good sushi place (more casual than Sei) we’d be in business! For more casual sushi in PQ try Momiji, Sushi-Go-Round or Sushi AOI. Momiji is awesome. Talk to Andy. The upstairs bartender. Great service. Anon Feb 20 @12:22PM – sorry to burst your bubble, but not everyone who attends Gtown (or the the other DC universities) comes from well-off families. A lot of students, including my wife, me and lots of my friends with whom I attended college, don’t fit your asinine stereotype. A new Pho place will be opening at 608 H St NW. Thanks for the sushi recommendations…however, I was thinking about something more in the PQ area for lunch while working. For those of us who work in the F Street area around 12th Street. Very excited about Pret-a-Manger however! SG, good news on the Pho place. Do you have more info on pho place?Did you just walk by it or saw a mention on a website? I walk past this place three days a week going to evening grad school classes at Georgetown. It is always pretty light on customers but seeing this blog entry made me want to try it since I live in PQ and it is coming to our hood. So, yesterday I went in and had two fish tacos, fried green tomatoes, and a diet soda. $14.62. A little too much food for one person as I didn’t realize the serving of FG Tomatoes would be so large. The food was nothing special. The tacos were made with a filet not shredded fish. Very “saucey” which made the tortilla soggy and messy to eat. I don’t think I would visit here again.